Le Moulin de la Tuilerie was once the country home of the Duke and Duchess of Windsor. King Edward VIII abdicated in 1936 so he could marry Wallis Simpson. 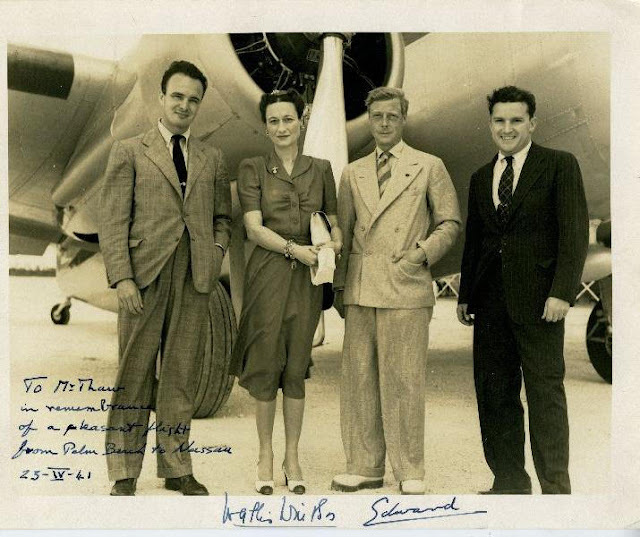 Their wedding took place in 1937 and after that the couple spent the rest of their lives in exile, moving from one home to another until they finally settled in Paris. Then, they saw Le Moulin de la Tuilerie and it was love at first sight. 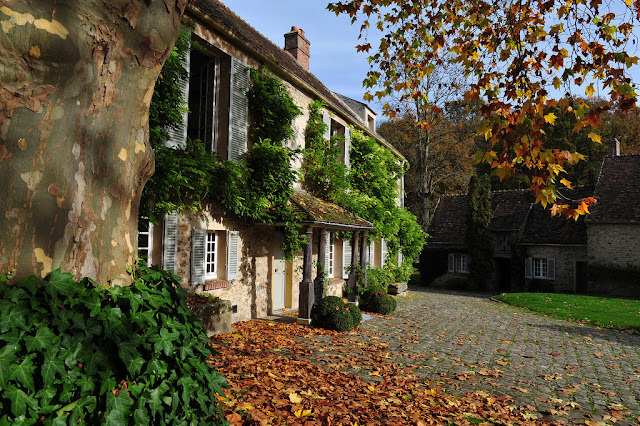 Set in a tranquil setting on the foot of a valley in Gif-sur-Yvette, Le Moulin de la Tuilerie is not the typical abode you think a lady of elegant standard like Wallis, Duchess of Windsor, would prefer for herself or for her husband. But in this rambling complex of rustic cottages, the royal couple felt free and at ease. Almost every weekend they fled the hustle and bustle of Paris and so they drove to the countryside to rest and entertain friends in a more relaxed pace. The grandness of the Windsors' Parisian villa on Bois de Bologne suited well to the Duchess, but the Duke yearned for an expansive ground where "he could happily toil." In 1952, they learned that their friend, artist Etienne Drian was selling his country estate, so they drove to Gif Sur Yvette to inspect the property. The short trip was already a delight for the couple- the verdant meadows they passed through reminded the Duke of England's pastures. Now exiled in France, he had to make himself feel at home. The Duchess of Windsor was immediately enchanted by the property, while the Duke had foreseen himself enjoying carefree days in the estate. The following day, they initially offered to lease it from Drian but later bought the property outright. They paid him $80,000 for the estate, the only house, according to King, that the couple would ever own. Le Moulin de la Tuilerie sits on 26 acres of land with the River Merantaise running in between. While the land area is no match to Sandringham or Balmoral's thousands upon thousands of acres of gardens and woodlands, it afforded the former king a land large enough to unleash the gardener in him. A tall stone wall keeps the lodgings away from the passing public. From the grand oak gate, a narrow stone path passes by a two-storey stone building for housekeepers and guests. Behind cobbled courtyard is a breathtaking valley that gives the royals and their high profile friends with that soporific sense each time they step in the property. Each cottage has its own private terrace so guests could freely roam around the extensive grounds or walk by the flower beds that lead to the centuries-old rocky woodland. The estate boasts of four buildings, with the ancient millhouse as the oldest and the most spacious structure. The two-foot thick stone walls and low ceilings add up to its charming appeal. When Drian acquired the property, he converted Le Moulin de la Tuilerie into stylish and comfortable lodgings. Wallis still wanted to place her imprint on the property, and so an extensive and ambitious work was embarked to transform the place befitting the Duchess' quaint style, "installing modern conveniences," including a "new septic system." She also updated the other structures in the property, including the barn, servants’ quarters, and the farm buildings. The ceilings, walls, and floors will have to be sturdy, she told herself. To reinforce her home she had the service of best local crafsmen and builders she could scout. Even in her decorating schemes, Wallis lent her colourful personality! "I wanted to have a fling with rich, bright colours," she once noted on a newspaper. "Every house should have a theme: then the decoration becomes something like a musical composition; each room carries the theme but with variations of mood and pace." However, not everyone agreed on the duchess when it comes to making up a tasteful abode. In fact, even her friend, Diana Mosley (of the Mitford Sisters fame) considered her choices as dazzlingly ugly. "It was very bright with patterned carpets, lots of apricot, and really more Palm Beach than English or French," Diana Mosley said. American decorator Billy Baldwin even thought her decoration was rather cheap: "Most of the mill was awfully tacky but that's what Wallis had – tacky southern taste, much too overdone, much too elaborate and no real charm," he mentioned (Suzy Menkes). The Duchess commissioned a painting on the main wall of the upstairs reception room, showing a water mill with the words: "I'm not the miller's daughter but I've been through the mill." The mural depicted the humiliation she thought she had endured from the British Royal Family. The mural remains today, as clear it was painted over 60 years ago. Photographs of the cottage from the 1950s and 1960s revealed that the cottage contained reminds of the duke’s glorious days. A huge world map, for example, hung on one of the walls, showing the route he took in the 1920s when, as a Prince of Wales, he had to travel around the empire. In another wall hung a frame containing the regimental buttons of the British unit which fought in the trenches during World War I. The Duke truly revelled on the sense of peace he felt each time he strolled on his grounds. "It is a very tranquil place," he confesses, "where one can garden as one should in old clothes, with one's hands among familiar plants." Maintaining the grounds was a tedious task and the duke relied on his five gardeners to keep the plants immaculate. He hired one French, two Spanish, two Alsatian and gardeners. The Duchess of Windsor fondly recalls how her husband “likes to talk German with them,” a proof of how much the duke wanted to be involved in every detail of creating his bit of paradise. The grounds also served as the resting place of Edward and Wallis’ beloved pugs—Trooper, Disraeli, Imp, and Davy Crockett. Their graveyard can still be found underneath the trees and boulders of what is known as "Cardiac Hill." The duke used to force his overweight guests to climb to the crest, much to their gasp for breath while the master of the house simply puffed his cigar. Most weekends, the Duke and Duchess made their trip on their Daimler complete with their luggage and pugs. Two maids came with them taking the light blue Cadillac station-wagon. Another account notes that the duke drove on his Chevrolet, while the duchess in her blue Cadillac and their staff in a Citroën. The staff would always arrive ahead of them to make sure everything is immaculately ready by the time the master and the mistress came home. Joining them most weekends would be a glittering guest list of nobility and celebrities of the day. The darling of the international café society, the 1950s and 60s highlighted the duke and duchess’ lives as international jetsetters. In the Le Moulin they provided a relaxing space to guests like Maria Callas, Marlene Dietrich, Elizabeth Taylor & Richard Burton, and Cecil Beaton. They were always treated to a sumptuous meal, but their first dinner would always be made special by a welcome dance to the tune of the “latest American hits or the Duke’s bagpipe rendition of ‘Over the Sky.’” It’s as if they were they still entertaining guests at Fort Belvedere. The Windsors, who always cried poor, lived a lavish lifestyle putting less emphasis on the delicate state of their finances. They preferred always the finest things in life, with a retinue of servants beside them to follow orders. Maintaining their Parisian residence and Le Moulin de Tuilirie, not to include the cost of their day-to-day expenses and travels was too much for the duke’s paltry British pension of £ 20,000 per annum. By the 1970s, the couple proposed to the local government of converting the property into “537 dwellings, 560 parking spaces and a tennis club.” But the mayor of Gif balked at the idea and the Windsors’ plan never materialized When the Duke died in 1972, the Duchess of Windsor was quick to dispose the property. She became increasingly frail and senile shortly afterwards. She died in 1986 a lonely, forgotten figure, neglected by the Royal Family. Le Moulin de la Tuilerie is now owned by The Landmark Trust, the non-profit’s first-ever acquisition outside the British soil. Finally, the estate has finally found a reliable guardian. Higgins,C harlotte (2010, December 4). Live like a king in France. The Guardian. Klein, Richard. (2001). Jewelry Talks: A Novel Thesis. New Yorl: Knopf Doubleday. Lovell, Mary S. (2001). The Sisters: The Saga of the Mitford Family. New York: W.W. Norton & Co.
Menkes, Suzy (1987). The Windsor Style. Grafton. Platt, Owen (2003). The Royal Governor.....and the Duchess: The Duke and Duchess of Windsor in The Bahamas 1940-1945. Lincoln NE: iUniverse. Smith, Sylvia. (2012, January 13). Reliving a royal scandal at the French home of the Duke and Duchess of Windsor. The Daily Mail. Vickers, Hugo (2011). Behind Closed Doors. Hutchinson. Wilson, Christopher. (2000). Dancing with the Devil: The Windsors and Jimmy Donahue. St. Martin's Press.